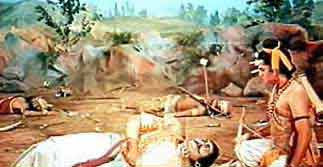 After hit by an arrow of Bhagavan Sri Ram, Ravana lies on the battlefield wounded. Hanuman then reminds Sri Ram that in spite all his follies, Ravana was a great scholar and his knowledge should not be lost forever. Both Sri Ram and Lakshman went to a dying Ravana to learn from him. They wanted to make the demon king their Guru. An arrogant Lakshman first approached Ravana and stood near his head and demanded that he share his knowledge with the victors as they will use it for the good of his people. But Ravana did not speak. Then Bhagavan Sri Ram approached Ravana. Kneeled near the feet of Ravan and offered his respects. Sri Ram said that He had to take the life Ravana because He had to protect His wife as it was His Dharma. He also said that He respected the scholar in Ravana and would be great if he shared his knowledge as it will be of great use to the world. Bhagavan Sri Ram’s humility pleased Ravana and accepted him as his pupil. Thus Ravana became the Guru of Sri Ram. Ravana said that he had rejected Lakshman because he did not have the quality of a true pupil as he was rude and impolite. Then Ravana gave lessons in philosophy, politics, warfare, economics, arts, music, dance etc to Sri Ram.